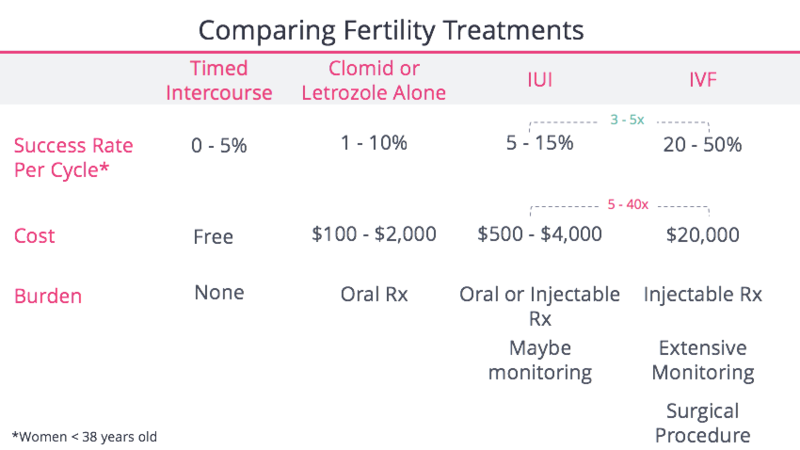 Compared with IUI or intrauterine insemination, IVF is significantly more effective (3 - 5 times higher rates of success) but also significantly more expensive (5 - 40 times more costly). 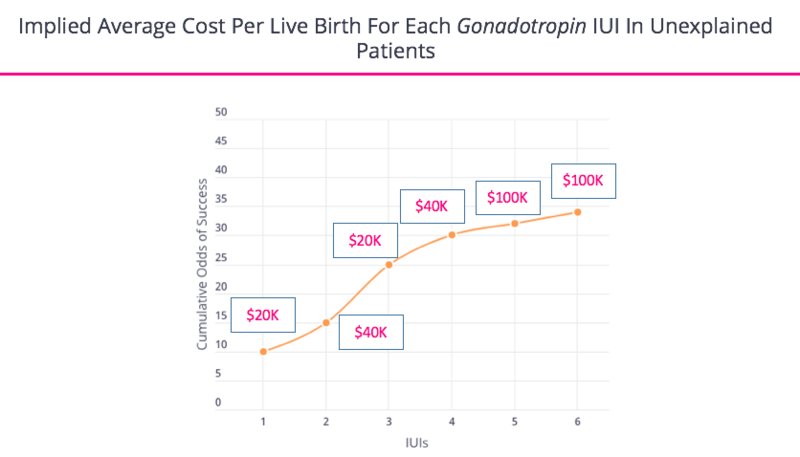 However, after one or two IUI’s, the odds of success stop improving and thus the cost-per-baby begin to skyrocket, whereby IUI stops looking like particularly good value compared with IVF. 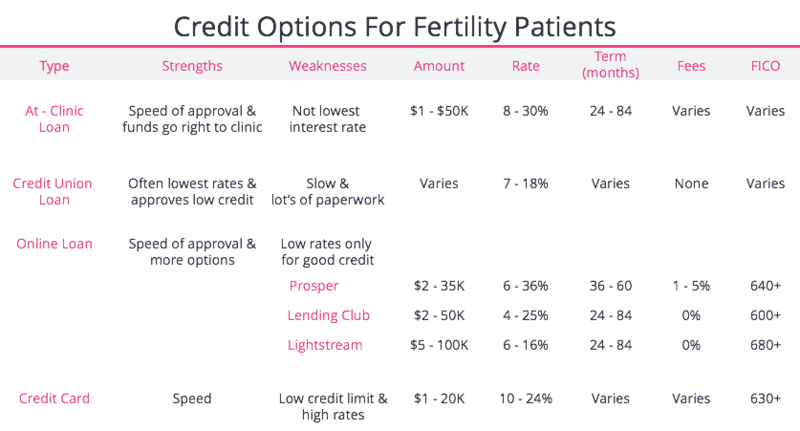 Despite IVF’s relative effectiveness, the average fertility patient undergoes over two cycles and so the cumulative IVF costs for most fertility patients reach into the $40,000 - $60,000 range. Below is our proprietary data from over 23,000 fertility patients. Unfortunately, most fertility patients will not have an insurance plan that covers the cost of treatment. The exceptions to that are patients who work in states like Massachusetts, Illinois, Maryland, New Jersey, Rhode Island, and Delaware where legislation applies more pressure for employers to cover treatment. Often, whether a patient has IVF covered is dictated by the insurance policy from their employer. We’ve built the largest database of employer coverage and you can see this year’s latest details here. For those interested in financing options, there are typically loan options available with annual rates that are generally competitive compared to loans offered for other types of medical services. Below you can see a general depiction of the options and the tradeoffs for each. Generally speaking, patients need a FICO score of above 600 and thereafter there is a tradeoff between convenience, speed, and annual interest rates. Finally, half of US clinics offer patients the chance to buy cycles in bulk for a discount (known as a package) or with a refund feature (known as "shared risk"). We have mixed opinions on these programs (as you can see in our detailed rundown), but typically believe they are offered to patients who are likely to succeed early in treatment (2/3 of refund patients succeed in the first cycle, see below) and thus these customers dramatically overpay for results they would have gotten anyhow. What's more, the list of medical exclusions is large (medication, PGS, pre-treatment testing) and as a result most patients spend 25 - 50% beyond the quoted "sticker price". That said, patient levels of satisfaction with these programs are high, though we personally believe that’s irrational. If you are being offered access to such a program, consider why, the success rates (at which cycle) others like you in the program enjoyed, and the real cash outlay you're likely to incur.